I couldn’t possibly pack all I might need. Then I can’t even find what I did pack. Especially when I’m not staying in one place. My friend Montserrat and I spent our first glorious French night in Rennes. Packing to leave Rennes, I forgot my hair dryer there. Our airbnb host was nice enough to write me the news. I wouldn’t have missed it til I washed my hair Sunday or Monday. Instead, I’ve been missing it. I contemplated buying a new one at the Monoprix the other day, except theirs was big. Mine had been a small travel one. Do I really need it, I ask myself? Can I live with my curly-haired self? What’s in the angle of a hair shaft? Bien sur vanity. And yet, don’t I have a right to “manage” my looks as best I can? Don’t we all? It helps of course if you like your looks exactly as they are. Even then, one chooses, long or short, styled or au naturel, brushed or dreads. C’mon. You choose too. N’est-ce pas? Then there’s the business of food. Montserrat and I have been joking that we are on a Fre nch food trip. It’s a joke, and it isn’t. If I keep eating like this I’ll be dead in a week. Ok, not funny. 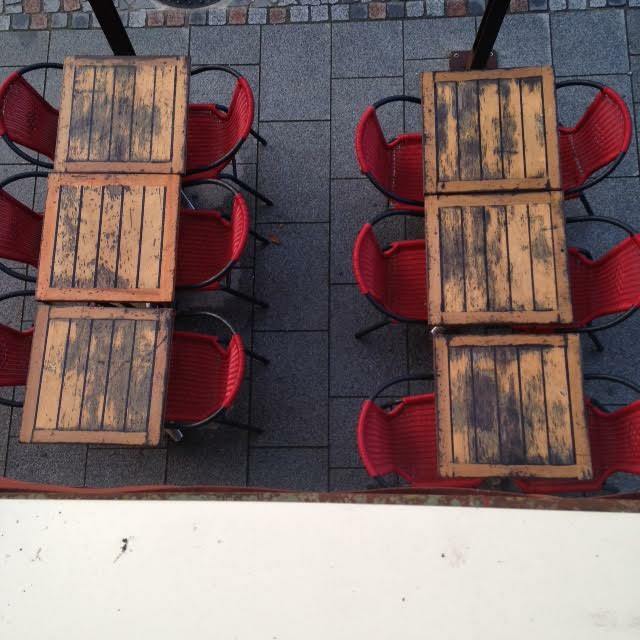 What is not to adore about French food? Looking gluten full-on in its glutinous, ruinous face and not getting ill with every manner of bread, pastry, tart? Ouiiiiii! French wheat Must be different than American wheat. Here where bread and butter carry equal weight in sublimity, have truly met their match (each other), and I, mine… no food is more perfect than truly french baguette and butter. 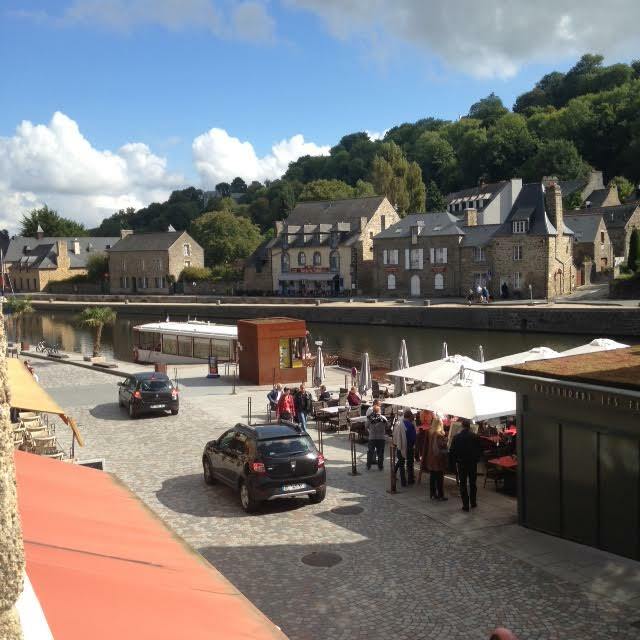 First morning in Dinan. 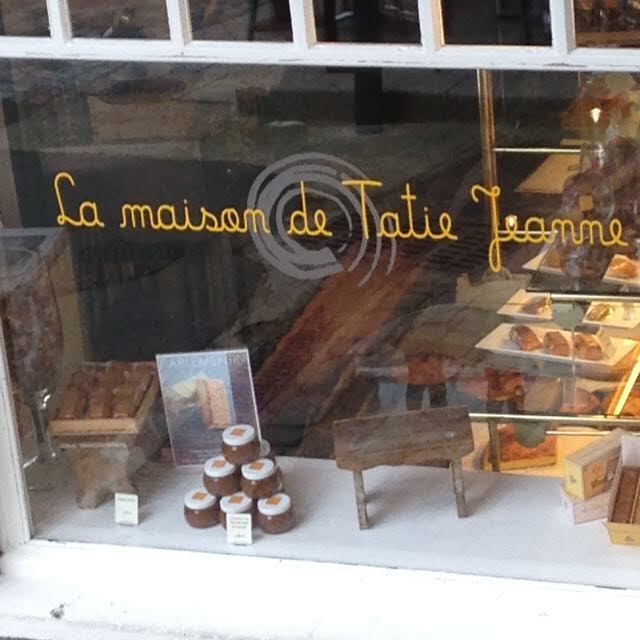 There is a patisserie/boulangerie across the narrow rue from us. I walk the ten cobblestone paces and buy a small apple pastry (Kouign Amann), a chocolate croissant (pain au chocolat), and baguette. Re-trace my ten paces back to the front door of our apartment – 55 rue du Petit Fort, built in 1732. Climb the stairs, enter the kitchen. With a little added butter and rhubarb jam (if you will), I eat half the baguette, half the apple pastry, and the whole bloody chocolate croissant. Did I mention the hot chocolate the patisserie also offers? For lunch I had a crepe (healthy buckwheat?) oozing, gooey cheese and mushrooms. For dessert, another hot chocolate. Pourquoi pas? Am I not on my bien-fantasized French vacation? For dinner Montserrat and I made a healthy salad in our kitchen, and finished off the morning baguette, half a wheel of some kind of not-quite-smelly-enough-for-my-taste-but-nonetheless-yummy-runny cheese, and TWO different obscenely decadent pastries. 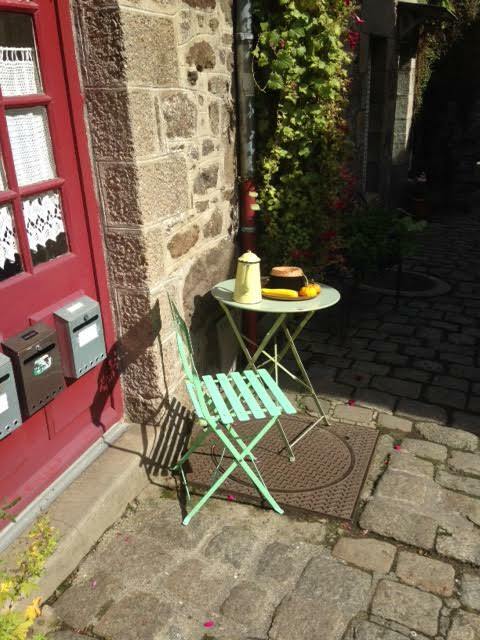 We wouldn’t have, but the patisserie was open when we got home from our long afternoon cobblestoned stroll around Dinan. What are hungry girls to do? The above paragraph wouldn’t be SO bad if it weren’t for the stark reality of numbers when it comes to my other food challenge. Diabetes. Who am I fooling? For years I have been trying to line up, to have in accord, my desirous mouth and the rest of my body. Like a patient matchmaker, I have slowly trained my mouth and body into more than a passing acquaintance with each other. In this way, I have maintained some integrity and well-being of my somewhat health-challenged body. (and whose isn’t? Type II diabetes is literally epidemic in America). Fr ankly, with pastries and food that taste this good, I don’t know how Diabetes isn’t epidemic here in France. This week my mouth (and big eyes) deserted (and desserted) the rest of my body. How am I gonna bring mouth and body back into accord, on the same vacation? Slowly I am answering my own question. Moderation. Duh. I did better the next day. Not great. But butter. I mean… better. On another note, the proprietress of our apartment is named Marie-Annick. If you don’t speak French, it doesn’t sound like the words look in American English. It sounds like music. When I first laid eyes on Marie-Annick, who is about fifty-five or sixty-five (it’s hard to tell), she reminded me of my aunt (by marriage), Aunt Jackie. She resembles my Aunt Jackie. Aunt Jackie was also from Bretagne, and returned every summer with my cousin. My uncle had “found her” at the end of WWII when he was over here, brought her back to New York, then Arizona. It was never a fit. I met her when I was 7. I found her fascinating, and loved my cousin Billy, but after a year, a falling out between my father and his brother, my mother and the brother’s wife ended my chance at knowing my French aunt and cousin. Still I had been infected with the foreign-ness. Really never got over the loss. Being here in Dinan brought it up. The strange and sometimes subterranean ways we’re inter-connected. Why we have passions for the things we do. My uncle. My French aunt. My cousin Billy. All dead. Also my father. And with them the story. The history. I have my mother’s version, but it seems partisan. I’m sure the thing between my mother and aunt was a question of different cultural norms of child-rearing. Traditional Breton vs Brooklyn Jewish seriously modified by southwestern faux-cowboy-&-Indian-laissez faire. That and probably errors in translation. After Jackie, my mother never cared for anything French. Me? I’m the opposite. So I eat. And try to let the past be in the past. In the present, I allow myself my love of France. The fantasy still emerges that I could have been a little girl visiting my aunt and cousin in Bretagne each summer. Back in the present, I try to sort out the relationship between the elder me’s body and mouth. Try to be both player and referee. Lover of sweets and food monitor/advisor. Lots of chapeaux to wear. And a deep happiness to be giving it a go. Merci beaucoup! When I was in France in the late 70’s I gained 10 pounds. Very deliciously. I lost it all and then some in India a couple of years later. From information I’ve gotten I think it is the chemical used to finish the wheat in the US that is causing a lot of the grain sensitivity, not the gluten since the majority of people don’t have celiac disease. Have a wonderful time and enjoy and savor all that great food. Looking forward to hearing more.